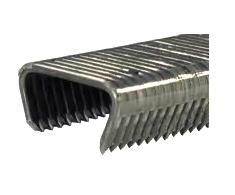 PRODUCT: 3/4 inch D-Style 15-Gauge Collated Hog Ring Staples, 304 Stainless Steel, Sharp Point. 50/Strip. 10,000/Box. Price/Box. 3/4" open ring diameter, 1/4" ID Triangle When closed. 100 BOXES / PALLET. SKID WEIGHT ABOUT 1730 LBS.